Kinetic 2015 Magnetic from Kinetic on Vimeo. The Kinetic Magnetic 3 it the latest version for 2016. 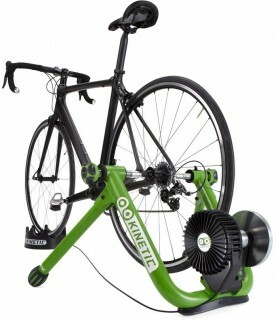 Using a magnetic brake the New Kinetic Magnetic turbo trainer provides a smooth and quiet resistance. Kurt Kinetic claim that this trainer runs quieter than its competitors, and its unique design provides a cooler performance and makes for a more consistent performance. 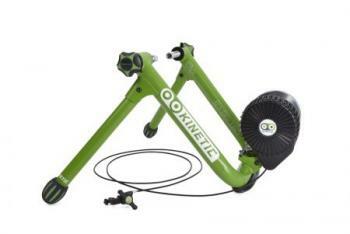 It is a direct innovation to the original Kinetic Magnetic turbo trainer. 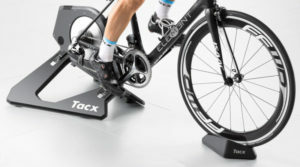 Even though it is a magnetic trainer the New Kinetic Magnetic behaves more like a fluid or wind trainer offering progressive resistance. You can set 9 different resistance curve levels using a handlebar mounted resistance lever, and Kurt Kinetic's magnetic trainer provides a higher resistance workout compared to their fluid trainers, such as the New Road Machine and the New Rock and Roll. Since this magnetic trainer offers higher progressive resistance than the Kinetic fluid trainers it is better suited for mountain gearing workouts, simulating climbing. Its large flywheel gives realistic inertial forces, and its large resistance roller fits wheels from 22” to 29”.